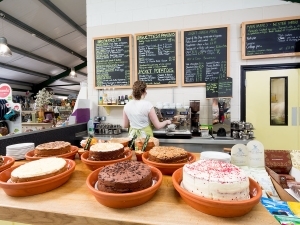 At the fully licenced Root One Café, all our food is freshly prepared and locally-sourced. You can enjoy hot and cold drinks, sweet and savoury snacks, sandwiches and hot meals. 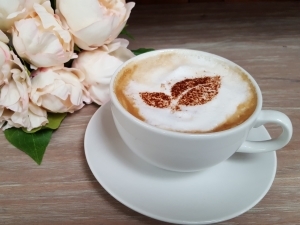 Top-of-the-bill are our popular all-day breakfasts, scrumptious home-made cakes, delicious Sunday roasts and freshly-ground Italian coffee. Inside, the café can seat 60, so there’s plenty of space for lunch and tea parties. And whenever there’s a break in the weather you can eat on our terrace. 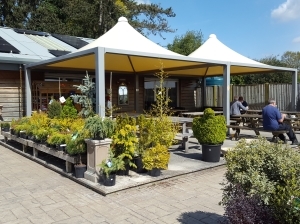 At Root One we allow dogs on leads in the garden centre and on the Café terrace. Please note that due to hygiene reasons we cannot allow dogs inside the Café. We cater for all at Root One and have a menu designed with Gluten Free and Vegetarian options. We have a great menu for the little eaters too. From time to time we are asked if we can host private functions in the café. In the past these have included birthday parties, Christmas lunches and wakes. Please contact us and we will be happy to discuss options that might be available. On a journey down south we needed to find somewhere to have a decent breakfast. So we checked TripAdvisor and found this place. What a good find. Fantastic breakfast excellent service. Highly recommend. Yet another of your excellent all-day breakfasts (jumbo) on Friday, including the usual nice service. I’ve had adbs all over the place, including posh hotels, and yours is the best. The “brown” toast makes it even better.